A co-ed chemistry fraternity for majors in all fields. An organization for anyone interested in Engineering and Science in the Armenian community. CURE at UCLA aims to expose, interest, and prepare undergraduate students for an optimized and exciting research experience. Representing undergraduate and graduate students in EPSS. An organization that produces a day packed with STEM outreach presentations to thousands of visitors each fall. Provides academic, professional and personal support and guidance to African-American students in the STEM fields. Working to increase visibility and promote student participation at all educational levels in the physical and life sciences through community college outreach events and a quarterly lecture series. An organization for LGBTQ+ graduate and undergraduate students in STEM-fields at UCLA. An open platform for undergraduate students in scientific research to exchange knowledge, experience, and ideas relating to their respective field. Fostering the success of science students, postdocs and professionals by providing a forum for academic, social and community activities and services. An academic and social club where students interested in physics or physics-related activities come together to explore new things and have fun. Social events, workshops, and guest talks for students interested in statistics and data science. Organizers of the annual ASA DataFest — the largest data hackathon on the West Coast. Informs, empowers, and unites STEM transfer students at UCLA. An on-campus student chapter of the world’s largest scientific society, open to undergrads and grad students of all majors. The UCLA Summer Programs for Undergraduate Research (SPUR) offer upper division undergraduate students with outstanding academic potential the opportunity to work closely with faculty mentors on research projects. The programs are designed for students who wish to learn more about the graduate school experience and possibly pursue an academic career in teaching and research. Applications for summer 2018 are due March 31. This annual Student Alumni Association tradition gives undergraduates the opportunity to learn about careers in science, technology, engineering and mathematics as well as to interact with alumni who graduated with STEM degrees. Open to anyone interested in mathematics. A student-run academic journal funded and supported by the Howard Hughes Medical Institute (HHMI) and UCLA’s Undergraduate Research Center. Creating a supportive atmosphere for all women in every physical science field. Providing a supportive atmosphere for Korean students at UCLA studying in the science, technology, engineering, and mathematics (STEM) fields. Upsilon Lab is a department-sponsored organization within the UCLA Physics & Astronomy department. Undergraduates in the department provide other physics, biophysics, and astrophysics majors the opportunity to learn valuable skills to succeed in their future endeavors, whether in research, engineering, or other fields. WPS is an organization that seeks to create a supportive atmosphere for all women in science, technology, engineering, and mathematics (STEM) fields of study. Its goal is to provide encouragement and guidance to our members through research opportunities, academic related excursions, and social activities. Visit brc.ucla.edu for more work-life student resources. 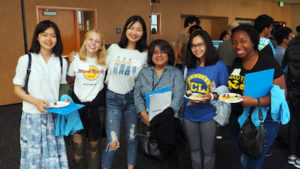 At the start of each academic year, Physical Sciences hosts a welcome event for all first-year (freshmen and transfer) students seeking to major in one of our departments. These events help new students begin to build a supportive network by bringing them together with faculty, alumni, graduate students, and older undergraduates. Click below for videos of these events featuring UCLA Physical Sciences alumni sharing their experiences and advice on being a student and pursuing a career in these sciences after graduation.